I have been busy reading the EPA’s Draft Inventory of U.S. Greenhouse Gas Emissions and Sinks: 1990 – 2012 which was released this past February and I am finding it to be a really great document on the subject. Granted, they do not even consider anything other than greenhouse gases are causing global warming, but there is still a huge amount of information for anyone, including climate change deniers. It is not a cozy little read, so you don’t want to snuggle up in bed with this document and a glass of wine. But, if you need to find some details on climate change and greenhouse gases, this would be a good place to start. Chapter 1 in the introduction and includes details on how the report was collected and organized. It also has details on which gases are considered to be greenhouse gases and how they act in the atmosphere, even their lifetimes and CO2 equivalents. For instance, the gas CF4 is 6,500 times as effective as a greenhouse gas as CO2 and will stay in the atmosphere for over 50,000 years. Another gas, SF6, will last only 3,200 years, but is 23,900 times as effective as CO2. Here’s another one, we emit almost as much CO2 from cars as we do from power plants, 1512 Tg CO2 Eq for power plants versus 1470 for cars. As a scientist, I just love lots of nice numbers like this. Data is what makes the scientific world go round. Will Lethal Pollution Convince China to Limit CO2 Emissions? There is already some controversy over the EPA U.S. Greenhouse Gas Inventory Report. Specifically, some researchers are claiming the EPA’s estimate of methane emissions from natural gas is much too low. In the report’s Executive Summary, the EPA stated, “Natural gas systems were the second largest anthropogenic source category of CH4 emissions in the United States in 2012 with 127.1 Tg CO2 Eq. of CH4 emitted into the atmosphere. Those emissions have decreased by 25.8 Tg CO2 Eq. (16.9 percent) since 1990.” But, a paper published in Science states that a study of the emissions data indicates the actual emissions may be as much as 50% higher than what is estimated by the EPA. Based on these figures, that would be an approximately 63 Tg CO2 Eq of extra CH4 emissions and that would be greater than the total reduction of 25.8 Tg CO2 Eq since 1990. However, according to the EPA report, total methane emissions decreased from 632.2 Tg CO2 Eq in 1990 to 564.4 Tg CO2 Eq in 2012. That is an overall decrease of 67.8 Tg CO2 Eq and that is greater than the estimated increase resulting from the natural gas industry. Natural gas (NG) is a potential “bridge fuel” during transition to a decarbonized energy system: It emits less carbon dioxide during combustion than other fossil fuels and can be used in many industries. However, because of the high global warming potential of methane (CH4, the major component of NG), climate benefits from NG use depend on system leakage rates. Some recent estimates of leakage have challenged the benefits of switching from coal to NG, a large near-term greenhouse gas (GHG) reduction opportunity (1–3). Also, global atmospheric CH4 concentrations are on the rise, with the causes still poorly understood (4). They conclude that there is more methane being released than the EPA estimates, but the amount is still better than the equivalent emissions that would be emitted by coal-fired power plants. The EPA’s Draft Inventory of U.S. Greenhouse Gas Emissions and Sinks, 1990 – 2012 was released on February 21, 2014. I have been looking it over and have noted some things about it that I wanted to comment on here. I may make further postings in the future as I work my way through it. The units Tg, CO2 eq. are million metric tons, CO2 equivalent. The significance of this chart is the downward trend in greenhouse gas emissions in this country. Total emissions and emissions of CO2 are both down to levels not seen since before 1994. This is a very good trend. I have yet to see it specifically stated in this report, but I read elsewhere that this was occurring due to the greater use of natural gas versus coal for electrical plants. With all of the fracking going on, there is a surge in natural gas production, so this trend will hopefully continue. The report also states that methane emissions have decreased by 10.7% since 1990. Methane is 23 times more potent as a greenhouse gas than CO2 is, so this is also good news. There is also bad news. During the same period, aggregate weighted emissions of HFCs, PFCs, and SF6 rose by 60.1 Tg CO2 Eq. (66.6 percent). From 1990 to 2012, HFCs increased by 99.6 Tg CO2 Eq. (269.7 percent), PFCs decreased by 15.2 Tg CO2 Eq. 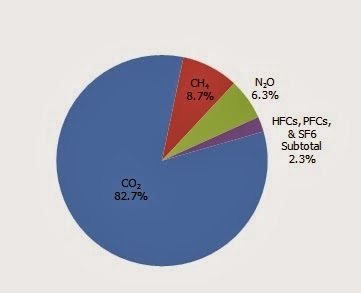 (73.8 percent), and SF6 decreased by 24.2 Tg CO2 Eq. (74.3 percent). Despite being emitted in smaller quantities relative to the other principal greenhouse gases, emissions of HFCs, PFCs, and SF6 are significant because many of these gases have extremely high global warming potentials and, in the cases of PFCs and SF6, long atmospheric lifetimes. The report is very long (the Executive Summary by itself is 27 pages) and, as you can imagine, is filled with lots of numbers. I will sort through it and post any interesting tidbits I find.